CAMWEST is organising questionaires to Western Sydney candidates for the up coming federal election. See the responses (we haven't got all of them yet). We believe that cycling issues should be discussed in the coming Federal election - there's a big role for Federal Government. If we can build the Western Orbital by 2007, why can't we build Sydney's bike network by 2005? Federal Government can surely help with funds (it is throwing $350M at the Orbital!). There are many reasons why the Federal Government should get more involved, like our dependence on oil and global warming and the Kyoto agreement. The tragic events in America have been a reminder that we need to minimise Australia's dependence on foreign oil. Instability in the Middle East could cause big swings in the oil price, which in turn could have a detrimental impact on our economy. The government needs to fund and encourage public transport and cycling. If it can fund road projects such as the Western Orbital (which will only generate more traffic and make us more dependent on oil), it can also fund the Parramatta-Chatswood Link train line. As another example, the government could require State Governments to spend just 2.5% of the Roads to Recovery funding on cycling infrastructure and initiatives. See the questionaire and the responses. The next CAMWEST ride is the Bay to Mountains, on Sunday 28th October (Active Australia day). Thank you to Holroyd Council who have agreed to financially support the ride. Fairfield Council have unfortunately told us they will not support the ride this year. We think community bike rides are a great opportunity for councils to encourage people to try riding and show the cycling work they do. More info. The Cycle Sydney is on Sunday 18th November 2001. There are two routes: 50km and 20km. It is ideal for the whole family - Enjoy riding Sydney's streets in safety! Join 5,000 other cyclists as we cross the bridge. 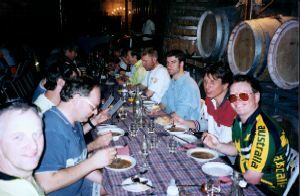 The last Tizzana Winery ride was a great success - don't miss out! This year's Tizzana bike ride was a great success yet again, with 51 riders coming. Make sure you don't miss out next year! More info. This is a social ride along quiet and picturesque roads with many views over the Hawkesbury River Valley, a few challenging hills, a couple of ferries crossings and short stretches of good gravel road to arrive at Tizzana Winery by 12:30 pm for a catered and very social lunch. The Parramatta Spring Carnival is also coming up, on October 4-7. This includes includes Carnivale, the Parramatta Food and Wine Fair and the Breadmakers Festival. Why not make a ride out of it? Ride to Parramatta, and perhaps return by Rivercat or train. From east, use the Parramatta River Valley cycleway, and from the south via the Parramatta-Liverpool RailTrail. Remember, your bike travels free on trains and ferrys on weekends. CAMWEST will have its very own stand at the up coming Bicycling Australia Show. The show is on Sunday October 21, at 10am-5pm at the Rosehill Gardens. More info. CAMWEST has surveyed the work done on Kliens Rd at Northmead and we are concerned with what has been implemented. We have drafted a letter to council expressing our concerns, namely the safety of cyclists especially where the lines curve around the pedestrian refuges. Parked cars are obstructing the lines. After a lot of talking about this area, we feel our suggestions have not been taken seriously. There needs to be a stronger and more genuine commitment from Council staff to take on board our feedback and the safety needs of cyclists in future such treatments. If you cycle along this bike route, you may like to send council an email expressing your concern (see Action Corner below). Due to council being slow to commence works scheduled the RTA have withdrawn the funding. Council were also late in submitting for funds with the RTA thereby missing $50K of potential funding. It seems that council have let down some of the good work that advocates like Doug have done in the area - a real shame. Parks people have re-altered the path sections of Crestwood Reserve, disrupting the regional route to Rouse Hill. Alterations seem to have taken no account to the regional route status. Sections within councils need to communicate when making changes. Modifications to reduce the environmental impacts of the Parramatta to Chatswood Rail Link have been released by the Minister for Transport, Mr Carl Scully, as the State Government sought final planning approval for the project. "I have appointed a new project team to explore all options for delivering the Epping to Parramatta section by the proposed 2010 deadline", Mr Scully said. The Parramatta - Epping section needs to be done as soon as possible. Some changes have been announced due to community feedback (including from CAMWEST). This includes the realignment of the rail corridor through Parramatta from Darcy Street to the north of the existing Parramatta Station to Argyle Street on the south side. This would reduce the impacts on heritage in Parramatta Park and at Lancer Barracks, and avoid disruption to the Arthur Phillip High School and local bus operations. There has been a lot of talk lately about crime in Sydney. Bike cops are a great way to address crime in urban areas. CAMWEST thinks that bicycle police units should be increased and well resourced. CAMWEST thinks these are an excellent idea. Using bikes for policing is a very cost-effective way of fighting crime and working together with the community. Bikes are quiet, fast, cheap, clean, and (most importantly) increase the profile of police in the community. 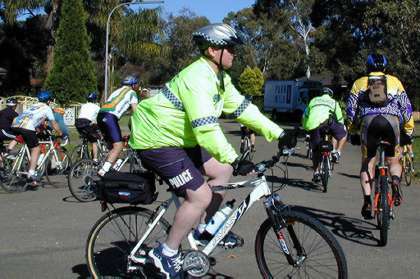 See our feature article on bike cops, including an interview with a Parramatta bike cop. The number of people subscribed to our newsletter has overtaken the 200 mark. Our newsletter allows us to communicate news and issues with many people interested in cycling in Western Sydney. "In 1999, 65 per cent of men and 45 per cent of women aged 23-64 years were reportedly overweight, compared with 52 per cent of men and 35 per cent of women 10 years earlier", states the Australian Health Trends 2001 report. With the known reserves of oil predicted to run out in about 40 years, the world has to start considering alternatives. Terrorism Fuels Further Debate over Arctic National Wildlife Refuge - Radio National's Earthbeat, Saturday 22 September 2001. In the aftermath of the terrorist attacks on the USA, will Americaþs wild and special places be sacrificed for oil extraction in the name of national security? The Arctic National Wildlife Refuge is at the centre of a heated debate. The Californian government has finally given up on solving its traffic problems by building more roads. Smart move - let's do the same. More people are being killed by exhaust fumes than by traffic accidents - and Australia has the highest level of exhaust emissions per capita than anywhere else in the world. Warning: The Sydney Morning Herald seems to have introduced fees for viewing its archived articles. Due to this, some of our article links may no longer work (or you'll need to pay for them). They have done some classifying of their articles, though, with a specific section on bicycle articles. We need more members to achieve better bike facilities in Western Sydney. Lately some members have become less involved because of personal circumstances. At the same time, there's a number of projects we'd like to get involved in. Join us and make a difference. This the international year of Volunteers is the perfect time! Write/Email to Parramatta City Council, express your concern at the Kleins Rd safety issues. I write to express my concern over the implementation of the Kleins Rd works. I feel it has introduced a number of safety risks for cyclists. Please support cycling in the Parramatta area. CAMWEST's Action Corner is where we include one or two suggestions of something simple and concrete that you can do: write an email, letter, representation, turn up for a ride, etc. Join us in making a difference!